In a carbon copy world of â€œcelebrityâ€ headphones, V-MODAâ€™s endorse yourselfTMÂ customs program gives customers and performers the option of expressing themselves.Â Users can choose from an array of over 12 colors of interchangeable ear shields that can also be professionally etched with their own artwork and logos, letters or numbers. 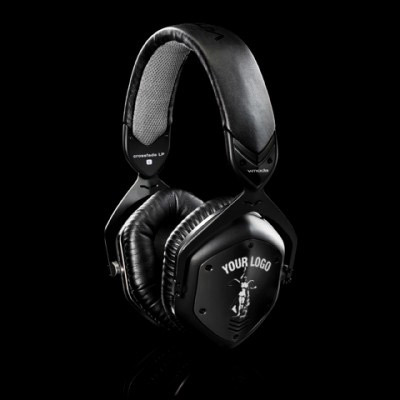 V-MODA’s endorse yourselfTMÂ program is also available to existing V-MODA Crossfade series customers. A refinement to the critically acclaimed sound of the Crossfade LP, the heart of the Crossfade LP2â€™s Live PlayTMÂ sound signature is its patent-pending and biggest-in-class 50mm Dual-Diaphragm Drivers and V-PORT 3D staging. This innovative driver displacement is energy efficient yet can recreate the sound of multiple drivers with the quality and consistency of a single driver. The driverâ€™s diaphragm is constructed of a harder inner ring for mids and highs and a soft outer ring dedicated to deep bass extension so you can actually feel the music, even with low powered sources. V-MODAâ€™s labs, over years of research, found that many headphones artificially spike the highs above 8kHz to make up for older recordings, hearing loss and for users who listen at lower volumes. The Crossfade LP2, is however, fine-tuned with a 31-band EQ, which plays a vital part in creating itâ€™s unique Live PlayTMÂ sound signature while protecting the ears from permanent hearing loss or damage. V-MODA is the maker of the finest professional quality and modern audiophile products. Itâ€™s products are distinguished by an extreme passion for music, materials, fashion-forward design and unparalleled quality. Led by professional DJ and Chief Visionary Officer, Val Kolton, V-MODA products blend the inspiration of Italian design, the essence of music, and the charisma of Hollywood. Together with design extraordinaire Joseph Bucknall, the worldâ€™s most influential producers, musicians and DJs, V-MODA is constantly challenging the norm and forging the remix revolution. For more information, please visit V-MODAÊ¼s website, V-MODA.com.